You can now read Newsbits in color! It's in Adobe Acrobat format to be viewed with your Adobe Acrobat Reader. (You may already have it installed so you will just need to mouse click to view it). Or, you can get a copy of the Reader by clicking on the hypertext below. Each month, we will be making our publication available here. 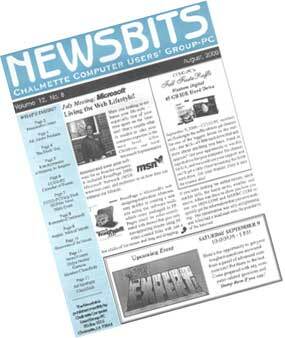 Enjoy "Online Newsbits!" "Extra! Extra! Hot off the Newsstand!" in your browser's toolbar. Depending upon modem speed and conditions, it' might take a few minutes (depending on your system)!" to have this FREE NEW Adobe Acrobat Reader installed. If you also need to publish your newsletter. it has a lot more extensive database.